The growth of the supermarket sector has been very rapid. Today, 30 global supermarket chains already control a third of the global retail food market, taking a huge share of the market of the food that the people around the world eat. This is not just a modern trend, an evolution of the way things are sold. Their vast expansion has been supported and promoted by Free Trade Agreements, investment liberalisation, government policies to promote foreign direct investment, and laws and regulations that make it more difficult for small-scale food systems to continue to operate. Supermarket distribution systems - just like the industrial farming system that produces the bulk raw materials that go into the cheap processed foods lining their shelves - are being tremendously subsidised by governments, using tax payers money. by changing how food is produced – they impose food production standards, norms and purchasing practices that make it very difficult for local farmers /small-scale food producers / processors to comply with. Small-scale farmers and producers are either pushed out of the market if they cannot meet the standards, consistently, at the right price, and produce in bulk, or are forced to start using intensive inputs. Through vertical integration, supermarkets are in some cases also taking control over farms, or sourcing their products from places where they can have the maximum amount of labour exploitation. by imposing an external food culture. With a few exceptions, mostly supermarkets are selling products of multinational food companies, mostly low-nutrition, processed foods. Processed foods tend to be much easier to present, store and therefore profit from than fresh food. More and more, people are eating a limited range of highly processed foods, presented as “convenient” while for most workers the choices of freshly prepared or locally produced foods are being narrowed. Health issues related to unhealthy diets such as heart problems, obesity and diabetes have emerged in parts of the world where they have never been seen before. by taking control over local food availability Supermarkets and convenience stores are investing heavily in taking over local distribution. They undercut local vendors until the local, independent, small-scale, retail sector is destroyed, when the dominant stores can increase the prices and expand the market for their products. Companies use immense influence on the political system to prevent protection of local food producers and sellers. Food safety and sanitation regulations are being used to wipe out huge traditional markets where people have traded and exchanged for generations. The arrival of supermarkets in a local community tend to devastate local retailers, local vendors, hawkers, and even entire wet markets. Small vendors currently provide daily food for a huge population across Asia and many other regions. In India, they number over 40 million, and it has been estimated that street vendors and hawkers are the 2nd largest workforce in Asia after farm labourers. In Mexico, it has been found that each convenience store on average wipes out 4-6 street vendors and other small corner stores. In many countries, the majority of those pushed out are women. The human relations that exist in local markets or between local vendors and farmers are utterly disrupted in the supermarket chain. Small stall holders, or hawkers, “fill the last mile” of the sale of small farm products – so they provide a very important connection between small producers / farmers and middle- and working-class consumers in Asia. When small retailers are wiped out, channels for farmers to sell their produce are closed off. By destroying local food distribution, companies are stealing livelihoods from the poorest. Supermarket employment will not replace those livelihoods. Giant retail chains extract the wealth generated by small-scale producers from the supply chain, and feed the profits to a small number of elite businessmen and multinational corporations. This is another very significant way that the gap between rich and poor is growing around the world. Very swift changes are happening in the retail sector in Asia which will have a further important consequence on livelihoods of food producers and sellers in the region. One clear trend in food retail in Asia in the last year is “new retail” - combining online and on-street retail stores. Through big data analysis, a handful of companies are gaining huge advantage in predicting and shaping consumer behaviour, poaching small retail markets, optimising vertical value chains, and optimising what is most profitable. With their micro reach to consumers based on purchasing data, global giants, such as Walmart and Amazon, are positioning themselves to sweep up the last mile of small retailers, rendering millions jobless, and reducing consumer choice. Companies are investing billions of US dollars in this “new retail”. New technologies are being tested triggering new trends, such as remotely-managed un-manned stores, remotely-operated farms, slashing the need for human employment and finding new direct ways of extracting wealth overseas. Governments everywhere have failed to regulate modern food retail companies to ensure fair trade. FTAs have promoted the industrial system of food production and processing, regional and international “supply chains”, watering down local regulations and opening up borders. In Africa, agricultural ministries are no longer as deeply involved in controlling what is grown in the country, or making policies on services and extension as they once were. Agricultural sector policy makers have pulled out from decision making on food production, and moved towards promoting agri-business. The new merger of online and offline businesses is very difficult to regulate. Alarm is growing, even within government bodies, that e-commerce and particularly cross-border e-commerce cannot be effectively controlled by current laws. The new wave of FTAs, like RCEP and TPP, may make it illegal for member countries to demand that online shopping “service suppliers” must have a local presence in its country or must source local produce. Can we choose to eat freshly produced food? Groups are fighting, some in movements, in countries all around the world, to preserve local food systems. Some campaign, for example in West Africa, to produce their own foods independently, and to open up space for their produce on retail shelves. Others, for example in parts of East Africa, have stopped sending their goods to the supermarkets. In Asia, protests and mobilisations have taken aim against the crackdown on traditional markets. For example, vendors and consumers in Seoul protested against the shutting down of the Noryangjin market in Korea, earlier this year. The Hawkers Federation in India have been leading a mass protest against the Flipkart acquisition for months this year. In Asia, we are seeing a unique collaboration between farmers, vendors, consumers, and the digital activists being forged. In Thailand, as elsewhere, networks of alternative “green” markets are expanding to promote spaces where sustainably-produced, local farm produce and traditional foods can be sold. Farmer networks are involved in breeding and selling their own indigenous varieties of vegetables and rice seeds, maintaining their independence from giant seed corporations. Promoting healthy alternative farming methods practised by small-scale farmers is important. But we cannot support small-scale farmers, if we do not work also on national food policy and challenge the systems that are currently dominated by giant food retail chains. When communities produce their own food, they address the most urgent and pertinent needs of that community, with their own creativity and means. This is what we call Food Sovereignty. In this way, people do not have to ask anyone permission to be, to exist, or to live. It is a way to defend your own territory, your own way of thinking, your own way of relating to one another. Whether or not you are a food producer, buy from farmers, from small stallholders. Get involved. And speak up for the rights of small-scale farmers and food producers, wherever you have a platform. Everyone has a small-scale farmer to thank for producing the basic components of their traditional foods, as well as sustaining and nourishing our environment. Support fairer policies. It is much cheaper to produce and sell food locally than to establish the big supermarkets. Cheap food does not exist in the supermarket - it is expensive if you count all the real costs. GRAIN has calculated that about half of all the greenhouse gas emissions in the world come from the industrial food system –causing enormous social and economic damage. The urban population is growing, consumers are an important political force now. We can bring change if we are engaged and can form alliances between consumers and farmers. The ongoing campaign to ban chlorpyrifos and paraquat in Thailand, for example, has been mainly driven by consumers. The serious health concerns and climate change generated in part from our unsustainable industrial food system are hugely destructive and will force change upon us. Think of a small-scale farmer, think of building links with the food producers, and hawkers, small retailers, small restaurants. Be part of this change. The above report is a summary of the presentations and discussions during a seminar to mark 21 years since Biothai was founded and the occasion of the visit of the GRAIN Foundation team, board members, and Asian partners to Thailand and the new Biothai Foundation office “Growing Diversity Park”. Participants from at least 14 countries* exchanged experience from local and international work on current trends that are threatening long lasting impacts on local food systems, small-scale farmers, food producers and local shopkeepers and street vendors, consumers health and the environment. *Uganda, Cote d’Ivoire, Argentina, Mexico, Chile, Brasil, Canada, France, Netherlands, Spain, Indonesia, India, United States and Thailand. The seminar was recorded live on Facebook, and most presentations and questions were in English. 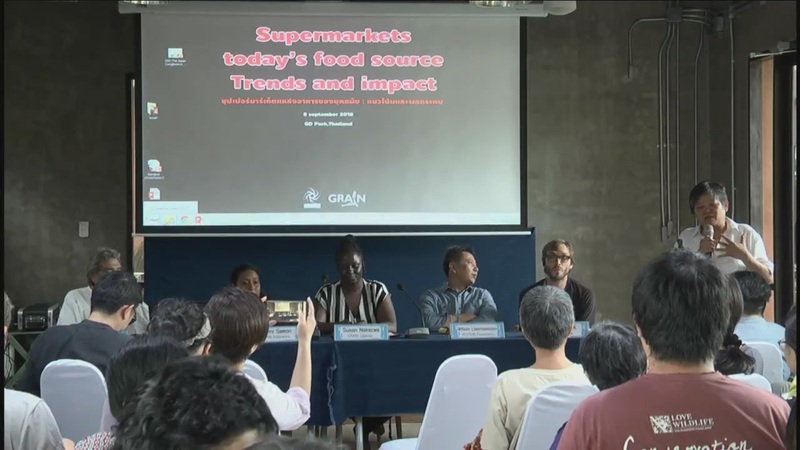 Presentations covered five issues: Devlin Kuyek provided an overview of the key issues in the global expansion of supermarkets; Susan Nakacwa focussed on the growth of supermarkets in Africa; Ramon Vera-Herrera spoke on native food systems vs industrial food processing in Mexico; Kartini Samon revealed the emergence of e-commerce in Asia; and Witoon Lianchamroon related the development and monopolisation of modern retail trade in Thailand.